Fieldsets contain group of settings for fields. Fieldset defines which actions to do with fields will be allowed for users: viewing, editing, or searching. Used fieldset is displayed on the “SharePoint Active Directory User Service Settings” page. One fieldset is used by default. 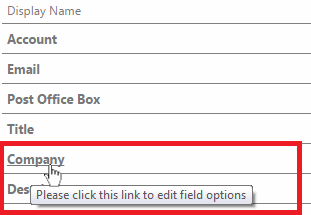 To change settings for field in the field set, just click the required field and make required modifications. Then click “Save”.